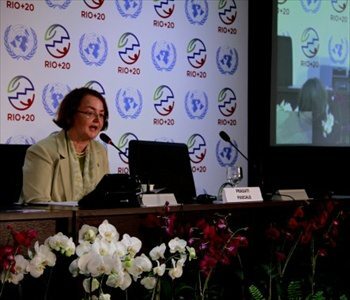 In this blog post, spokesperson for Rio+20 UN Conference on Sustainable Development and veteran United Nations staff member Pragati Pascale reflects on her experience being at the first Rio Earth Summit. How did you get involved with the first Earth Summit, and what was your role? I saw an article that the UN would be holding this major conference on environment and development, and I thought, wow, that would be very interesting to work on, so I asked around for who would be working on it, and I expressed my interest at an early stage. For over a year, we worked on the communications leading up to the Earth Summit. This was before the days of the Internet and e-mail – can you imagine that? Even the fax machine was just coming out – I don’t think we had one until after the conference. At the Summit itself, we had over 9,000 journalists – it may have been the biggest press participation we ever had at a UN conference. I worked with the Conference Spokesperson’s team on organizing the press conference schedule – which was chock-a- block from morning to evening, for two weeks straight — and getting the journalists the information they needed. It was the first time that the UN put on such a large-scale event, and we were not totally prepared for the numbers. I remember at some points, in order to get our work done, we stationed some local staff outside to try to answer media questions and we had to sort of barricade the door to our office. But we learned fast how to put on very large summits! What do you believe was the most successful element of the Earth Summit? It was a visionary event and it inspired participation by thousands of people. It was the first UN conference that had such a large NGO and civil society component, and that was key to its success in starting to get sustainable development into the popular awareness. The NGO Forum downtown was really happening. The outcome document, Agenda 21, was a groundbreaking agreement – a blueprint for sustainable development that was put together over months with help from experts brought together from many fields by Maurice Strong, the Conference Secretary-General. It is still the foundation document for sustainable development – and it has been used as a guide for local Agenda 21’s in thousands of cities and towns around the world, and at the national level too. The Rio Declaration and the Forest Principles were also agreed, and the Climate Change and Biodiversity Conventions were opened for signature. Where do you think the Earth Summit might have fallen short in what it was trying to achieve? The negotiations exposed the fault lines between North and South on sustainable development issues, which were a challenge then and continue to be so in many complex ways. Whereas many developed country governments and NGOs came in with a let’s save the planet approach, it became clear that developing countries felt the North had an historic responsibility for many global environment and development problems, and they had serious concerns about not having constraints placed on their growth. What do you feel might be different at Rio+20 in comparison to Rio 1992? We’re at a different stage of the process. Twenty years ago sustainable development was a visionary concept – and governments agreed on the foundations. Now, as the Secretary-General and Conference Secretary-General Sha Zukang have been saying, we have to keep working on implementation – on making sustainable development happen. The concept of innovative multi-partner initiatives has emerged since Rio as a way to generate concrete action – and we are seeing number of important commitments to be announced in Rio by governments, businesses, UN agencies and other partners. The Future We Want is the slogan for the Rio+20 outreach campaign, and we’ve seen an overwhelming number of people — including hundreds of millions of people on social media — making their voices heard about the future they want. In that regard, I think we are recapturing some of the original spirit of Rio.